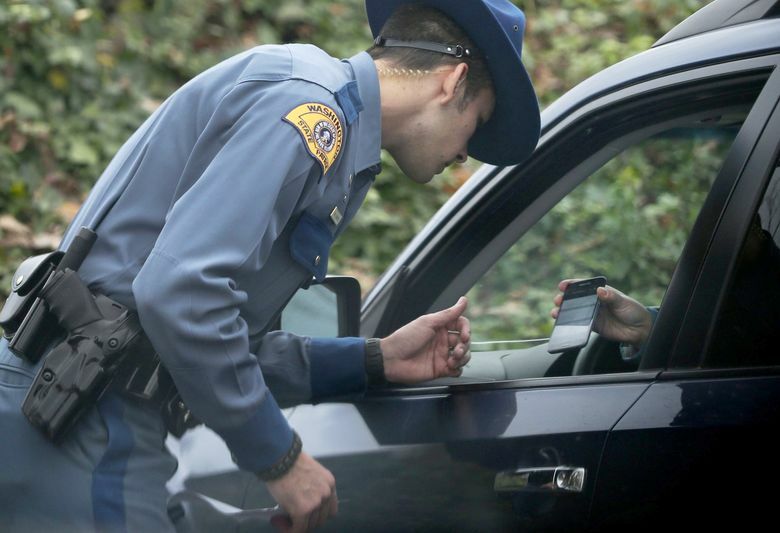 Some state lawmakers are preparing another run at toughening Washington’s decade-old distracted-driving laws in a bill tentatively called the Driving Under the Influence of Electronics Act. 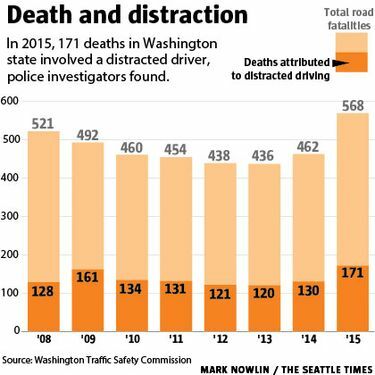 As deaths mount from distracted-driving crashes, victims and safety activists are gearing up for Washington state’s 2017 legislative session, where they will seek to ban virtually all use of handheld devices by motorists. State Rep. Jessyn Farrell, D-Seattle, and Sen. Ann Rivers, R-La Center, are drafting a bill tentatively called the Driving Under the Influence of Electronics Act. “Don’t hold it in your hand. Don’t poke at it,” Farrell said. • “A person operating a moving motor vehicle while holding a wireless communications device to his or her ear is guilty of a traffic infraction.” (2008) Hands-free and emergency calls are legal. Washington’s laws are a decade old. They bar texting and using a cellphone while holding it to the ear. Apps such as Twitter, Snapchat, Facebook Live and navigation maps were not yet popular companions. The first statute even implied driving one-handed was the root issue. Researchers have since proven that looking away from the road a few seconds and the brain overload of listening or multitasking are as dangerous as driving drunk. Distracted driving caused 3,477 traffic deaths in the U.S. in 2015, a 9 percent increase from the year before, and “a deadly epidemic,” according to the National Safety Council (NSC). In the state distracted-driving deaths jumped from 130 in 2014 to 171 in 2015, nearly a third of the overall 556 traffic fatalities in 2016. “If this 30 percent spike doesn’t send a message that what we’re doing now isn’t working, I don’t know what will,” Rivers said. A bill by Rivers to bar handheld devices in all but emergencies did pass the Senate 35-14, late in the 2015 session. The measure died in the House. House Transportation Committee Chairwoman Judy Clibborn, D-Mercer Island, said the odds of updating the distracted-driving laws are better this time. She said bills often take two or three years anyway, until lawmakers become familiar enough to vote yes. Shelly Baldwin, legislative liaison for the Washington Traffic Safety Commission, said there’s more energy this year. Clibborn said rising public awareness will aid the cause. Victims’ families, state troopers, prosecutors and high-school DECA chapters are working on the safety commission’s task force. “There is just a swirling vortex of people who want this to go through,” Baldwin said. Talking on a handheld phone while driving is banned in 14 states, and texting is banned in 46 states. Washington is in the mainstream. “I think none of the states are really leaders at this point,” said National Safety Council CEO Deborah Hersman. Rivers and Farrell are suggesting changes they consider politically achievable. For instance, the $124 fine for using handheld devices behind the wheel could be increased to $350, Rivers said. She also wants citations reported to courts and insurance companies. “We often find people will modify their behavior, if they know there will be higher, ongoing insurance rates,” Rivers said. That is likely to provoke opposition. Current law keeps cellphone and texting violations off someone’s driving record. Two years ago, then-Sen. Don Benton, R-Vancouver, argued against jacking up insurance rates. Farrell said certain angles are still under discussion, such as mobile devices that are mounted in a dashboard cradle — ubiquitous in downtown Seattle. Rep. Ed Orcutt of Kalama, Cowlitz County, ranking GOP member of the House Transportation Committee, opposed the earlier bill. In an interview last month, he said, “I think it’s possible to get a distracted-driving bill passed,” but it should target behavior, not a specific technology. However, Orcutt said distraction is dire enough to warrant legislation. “If we’re going to achieve, or get even close to the goal of zero fatalities, we’re going to have to address it,” he said. 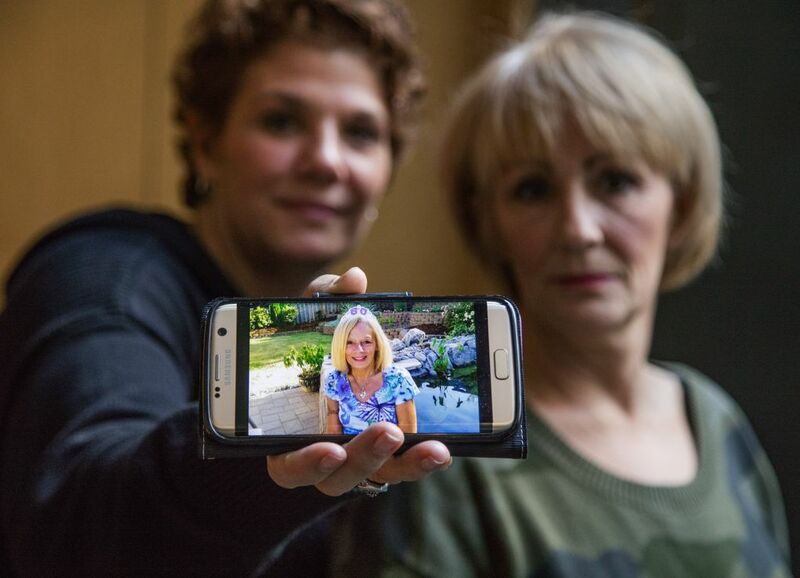 Safety groups might request money for publicity campaigns to stigmatize distracted driving. There also could be a push for language changes to criminal codes, to clarify how distraction is treated in vehicular-assault or vehicular-homicide cases. A tougher crackdown is being proposed in neighboring Oregon. The last two sessions in Washington suggest that nothing so harsh could pass here, Rivers said. Lawmakers will likely hear from the mother of Cody Meyer, a 23-year-old construction flagger who was hit last December outside Issaquah by a driver looking at a smartphone, charging documents say. Meyer died in April. The driver was charged with vehicular homicide; a judge ordered him to keep his cellphone in the trunk, pending trial. Cody Meyer’s mother, Tina Meyer, of Arlington, said the driver should be sentenced to apologize in educational speeches, and pick up roadside litter for three years, to feel the fear roadside workers in orange vests experience. “I get that you didn’t mean to kill my son, but you did mean to pick up your cellphone and look at it. You made a choice, just like a drunk driver, you chose to get in a vehicle and drive it,” she said. Jody Bagnariol, of Hillsboro, Ore., and her friend Elisabeth Rudolph of Seattle, died in July when their car, stopped in traffic on southbound I-5 at Napavine, Lewis County, was rear-ended at 76 mph, investigators found. Just before impact, the driver’s husband, sitting in the front passenger seat, took a “selfie,” but Lewis County prosecutors concluded from the photo that the driver was still facing forward. The evidence showed ordinary negligence, a prosecutor’s letter said, but not “an aggravated kind of negligence or carelessness” required to file felony charges. Bagnariol’s family, which is also ready to testify, is outraged at the idea of taking photos in the front seat of a car. “We have so much resource available to us in a three- or four-inch machine, that sits in our hand. That’s no longer ordinary,” said sister Gina Bagnariol-Benavides, whose late father, John Bagnariol, D-Renton, was speaker of the Washington state House in the late 1970s. 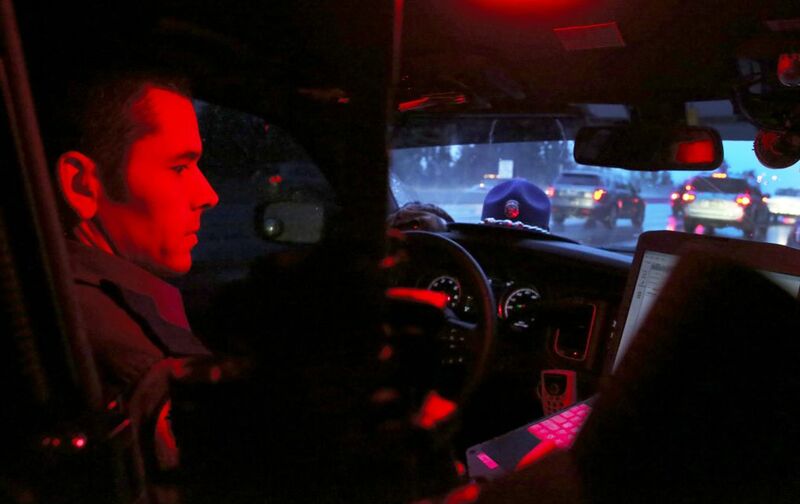 As soon as Trooper Marcus Sanchez merges onto Interstate 405 in Bellevue, it takes him less than a minute to find somebody speeding, tailgating, changing lanes without signaling — or using a cellphone behind the wheel. People look down at glowing phones in their laps, but to establish probable cause for a traffic stop Sanchez generally waits to see a phone at the ear. 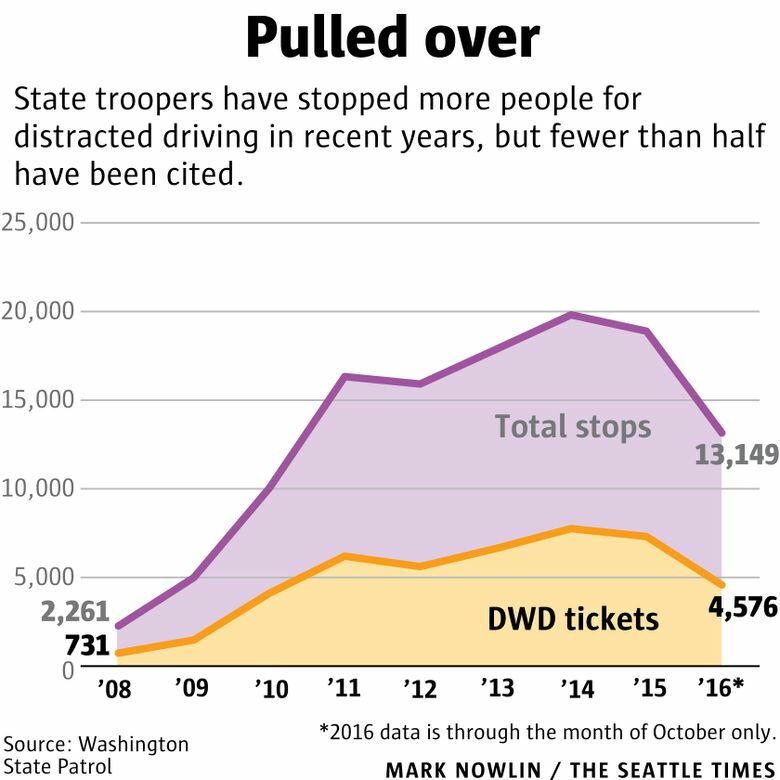 When they pull someone over, troopers write a citation for distracted driving less than half the time. “You can decide it was a distracted driver, but do you have enough proof to write the ticket?” Sanchez said. Also, he often prefers to educate somebody, with a verbal warning. Are advocates aiming high enough? Brain scans show that listening to sentences in hands-free mode reduced the lobe area that stayed on task, with a driving simulator. Drivers weaved more. Other experiments found losses in peripheral vision. “There is only so much the brain can do at one time,” the report said. A study by the AAA Foundation for Traffic Safety says that even built-in, voice-activated systems can impair brain focus for up to 15 to 27 seconds. This fall, the National Highway Transportation Safety Administration (NHTSA) proposed carmakers voluntarily build a “driver mode” that would disable mobile devices when a car is shifted out of park. Hersman, of the National Safety Council, called such proposals “a day late and a dollar short,” citing the extreme difficulty to build safeguards to keep pace with an avalanche of apps and devices. “Until we can have cars that drive themselves, we need people to be paying attention to the road,” she said. If that finally happens, members don’t seem likely to challenge hands-free systems, assuming that’s even possible. Regardless of what the 2017 Legislature decides, technology and habits can change faster than the speed of politics.